This home, as shown in the photograph, may differ from the actual blueprints. For more detailed information, please check the floor plans carefully. 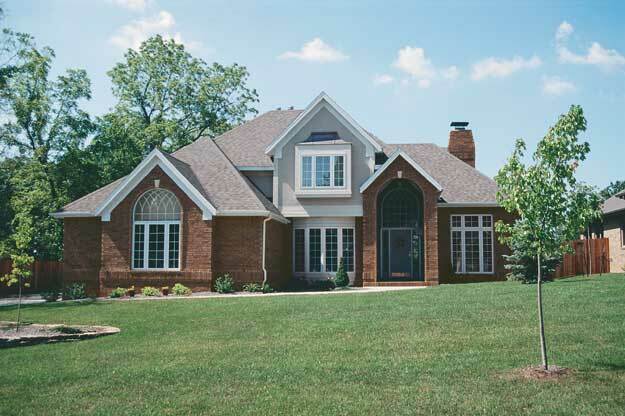 Maximum Ridge Height : 26'6"
This traditional house plan is perfect for everyday family life as well as for grand gatherings. Enter from the covered front stoop into the foyer, flanked by the formal dining room, which has a built-in hutch, and the living room, which shares the see-through fireplace with the family room. Both the family and living rooms feature transom-top windows and high ceilings that contribute to a splendid sense of spaciousness. The family room offers built-in entertainment centers on both sides of the fireplace. The kitchen features a large center island, corner pantry, built-in desk, and convenient access to the breakfast area, half bath, and laundry room. The secluded master suite's amenities include a high ceiling and private bath with spacious walk-in closet, whirlpool tub, separate shower, and double vanity. Upstairs, the other three bedrooms share two full bathrooms. The three-car garage features interior access. Return Policy - Since plans, EZ quotes and material lists ordered from ultimateplans.com are printed in response to your order, we cannot honor requests for refunds. It is the plan purchaser's responsibility to verify all lot conditions, measurements, and code requirements prior to ordering and building. Building Codes & Requirements - Our plans conformed to most national building codes when they were originally prepared. However, they may not meet all your local building regulations. Some counties and municipalities have their own building codes, regulations and requirements. The assistance of a local builder, architect or other building professional may be necessary to modify the drawings to comply with your area's specific requirements. We recommend you consult with your local building officials prior to beginning construction.